What Does a Canker Sore Look Like (Pictures)? What Are the Symptoms and Signs of a Canker Sore? How Do Medical Professionals Diagnose Canker Sores? Which Specialties of Doctors Treat Canker Sores? What Is the Treatment for Canker Sores? What Natural or Home Remedies Help Soothe Canker Sore Symptoms? What Medicine Helps Soothe and Cure Canker Sores? What Is the Next Step After Being Diagnosed With Canker Sores? Is It Possible to Prevent Canker Sores? What Is the Prognosis for a Person With Canker Sores? Canker sores, also known as aphthous ulcers, are among the most common causes of painful sores in the mouth. The classic canker sore lesion is a small (less than 1 centimeter) oval to round ulcer with a red (erythematous) border. Canker sores can occur on the gums, under the tongue, inside the cheeks and inside the lips (mucous membranes). Less than half of the U.S. population have canker sores at some point in their lives, but many people with them will have multiple episodes. The exact cause of canker sores is not known; however, the following factors have been suggested to precipitate outbreaks. Unless canker sores are a recurrent problem, no exams, tests, or treatment is needed. The peak incidence of canker sores occurs among people in adolescence and young adulthood. They become less frequent as we age. Canker sores occur more frequently in whites, nonsmokers, and people with higher socioeconomic status. Inflammatory bowel diseases (Crohn's disease and ulcerative colitis) have been associated with canker sores. Canker sores are not contagious. Home remedies for canker sores include salt water mouth rinses, vitamin B12, aloe Vera, and several herbs. OTC ointments, liquids, and other medicine helps canker sores heal and soothes pain. Canker sores are not the same thing as cold sores. Cold sores or "fever blisters" occur on the outer lip, whereas canker sores are found inside the mouth. Both hereditary and environmental causes of the disease have been suggested, but the exact cause is not clear. A number of factors have been suggested to precipitate outbreaks in susceptible individuals. Some studies have suggested an association with Helicobacter pylori, the same bacteria that cause peptic ulcers. Recent studies have suggested that treatment of the Helicobacter pylori infection may improve symptoms or completely stop recurrent disease in some people. Recurrent canker sores have been associated with inflammatory bowel diseases, such as Crohn's disease and ulcerative colitis. In these cases, the development of canker sores may signal a flare-up of the bowel disease. Celiac disease (celiac sprue, nontropical sprue, gluten intolerance, gluten-sensitive enteropathy) is a disease of the intestines caused by sensitivity to gluten, causes malabsorption and is associated with development of canker sores. Gluten refers to a group of proteins found in wheat, barley, and rye. Behçet's disease is a condition characterized by canker sores, genital sores that resemble canker sores, and inflammation of the eye. Infection with the AIDS virus also has been associated with canker sores. It is a common misconception that canker sores are a form of herpes infection. This is not the case. Canker sores occur in several forms. They can involve any area of the mouth except for the top of the tongue, lips, and hard palate. Minor canker sores (which account for the majority of aphthous ulcers) are oval and less than 10 mm (1/3 inch) across. Most are 2-3 mm with a white center. They are painful but clear up within three to 14 days without scarring. It is unusual for them to become infected. Major canker sores consist of deep ulcers measuring greater than 1 cm (1/3 inch). These ulcers, which are very painful, have irregular margins and often last for three to six weeks. They tend to heal with extensive scarring. A third form of canker sores, termed "herpetiform," resemble herpes infections and consist of many small shallow punched-out lesions, pinhead-sized (1-3 mm) in diameter, or less than 1/10 of an inch. Clusters of these sores may merge together to form large irregular ulcers. They last from seven to 10 days. Canker sores commonly come back. Some people have a few outbreaks a year, while others can have them almost all the time. If you have lesions persist beyond three weeks. Lesions lasting over three weeks raise the concern for oral cancer or inflammatory bowel disease (ulcerative colitis or Crohn's disease). Factors that may increase the risk of oral cancer include smoking, tobacco chewing, and use of alcohol. Canker sores are diagnosed by taking a careful history and observing the ulcers' typical appearance. No testing is needed in the majority of cases. However, if the diagnosis is uncertain, the disease is more severe, or other symptoms are present, the doctor may perform certain blood tests and even do a biopsy of the ulcer. The doctor, however, must consider the possibility of herpes or fungal infections, trauma, or sores that will not heal that could signal cancer. Canker sores may be seen in people with HIV infection, with inflammatory and other bowel diseases, and with certain medical conditions. 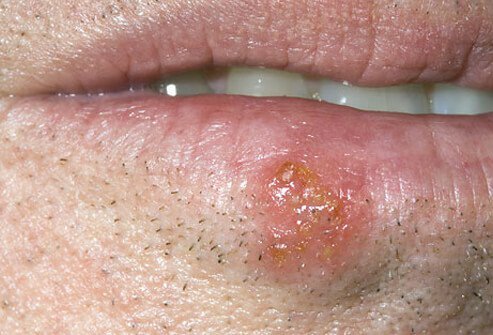 Herpetiform aphthous ulcers may be distinguished from true herpes sores by the fact that with the herpetiform canker sores, no vesicles (small blisters) appear before the ulcers do. Canker sores can be diagnosed and treated by any physician or dentist. Oral surgeons and dentists see these commonly in their practices. Since there are limited treatments, the important part is confirming the diagnosis and ordering tests if there are other concerning other symptoms. Some canker sores may be treated with home remedies and OTC products such as salt water rinses of the mouth, diphenhydramine (Benadryl), calamine lotion, licorice root, and other herbal liquids and ointments. Some canker sores may need medical treatment such as pain medications like silver nitrate; tetracycline suspensions; folic acid, vitamin B12, or iron supplements; and corticosteroids. Try rinsing the mouth with a solution of ½ teaspoon salt dissolved in 8 ounces of water. Another mixture consists of 1-2 tablespoons of Maalox mixed with ½ tablespoon of liquid diphenhydramine (Benadryl). Swish a teaspoonful in the mouth and spit it out. This can be done four times a day. Make sure that none of the mixture is swallowed, and be careful when using this remedy with children since Benadryl can cause toxicity. Some clinicians recommend the use of calamine (Calamox) lotion applied topically to the ulcer. However, this is an unapproved use and there are no controlled studies to support its safety or efficacy. Liquids or ointments with a numbing ingredient such as benzocaine (Anbesol, Oragel, Orabase, Zilactin-B, Tanac) help relieve the discomfort of canker sores. It is important to be careful not to use more than the recommended amounts per day to avoid toxicity. However, in April 2011 the U.S. FDA issued a warning about an association between benzocaine and methemoglobinemia, a rare but serious condition in which oxygen delivery to tissues is compromised. Because of this association, the FDA has stated that benzocaine products should not be used on children less than two years of age, except under the advice and supervision of a health care professional. Further, adults who use benzocaine gels or liquids to relieve pain in the mouth should follow the recommendations in the product label. Benzocaine products should be stored out of reach of children, and FDA encourages consumers to talk to their health-care professional about using benzocaine. Glycyrrhiza extract (CankerMelts) which comes from the root of licorice plant. This has been shown in one study to improve healing and decrease pain of canker sores. Vitamin B-12 (Avamin Melts): Although recommended by some authors, it has no well performed studies to support its use. A gel containing polyvinylpyrrolidone, sodium hyaluronate, and Aloe Vera (Canker-X): There is limited evidence supporting the benefit of this compound. Silver nitrate can be applied directly to the lesion. While a healthcare professional who is experienced in application should do this. Silver nitrate sticks can be purchased over the Internet. There is a randomized trial demonstrating the efficacy of this treatment. There is almost immediate relief of pain and the lesion heals over the next three to five days. Many people do not like the burnt taste that they get in their mouth immediately after the procedure but love the total relief of pain within a few hours. Debacterol is a combination of sulfonated phenolic compounds and sulfuric acid that works in a very similar manner to the silver nitrate. It chemically abrades/burns the ulcer. This causes almost immediate relief of the pain and causes the lesion to heal over the next three to five days. It is only available by prescription, but it can be applied by either a dentist or physician. It only has to be applied once. triamcinolone acetonide dental paste USP (Kenalog in Orabase): This can be applied up to three times a day, preferably after meals or at bedtime. amlexanox (Aphthasol): This can be applied up to four times a day, after each meal and at bedtime. There is little evidence that the medication actually decreases pain or speeds healing. tetracycline suspensions (Achromycin, Nor-tet, Panmycin, Sumycin, Tetracap): While these can be used as a mouthwash and can relieve pain and accelerate healing; however, their use does not prevent recurrence. Also, use for more than five days may cause problems with reactions and yeast infections in the mouth. Viscous lidocaine: This is a 2% gel that is applied to the affected area up to four times a day. In order to avoid toxicity, individuals should avoid swallowing the medication and should not use the medication more than four times a day. sucralfate (Carafate, a prescription medication used to treat peptic ulcers): This treatment is not recommended by many experts and there are limited studies supporting its use. You mix one tablet in 5-10 milliliters (1-2 teaspoons) of water. The slurry is swished around the mouth and spit out four times a day. The doctor may prescribe folic acid, iron, or vitamin B12 supplements if you are deficient in these. In such cases, you may require several months of therapy to improve. No benefit has been shown, however, from taking these vitamins if you are not deficient. Corticosteroids: In extremely severe cases, doctors may consider giving oral doses of corticosteroids, if they believe the benefits of treatment exceed the risks of oral steroids. Risks of steroid therapy include weight gain, weakening of the immune system, brittle bones, increase in gastric acidity leading to ulcers, and others. thalidomide (Thalomid): In extremely severe cases, doctors may consider using thalidomide. Unfortunately, its severe adverse effects limit its use, and it is only FDA approved for treatment of major aphthous ulcers in HIV-positive indviduals. Other potential medications. A long list of medications has been tried and may be used to treat aphthous ulcers in carefully selected patients. Each of these has significant potential adverse effects, and many are quite expensive. These include colchicine (Colcrys), pentoxifylline (Trental), Interferon, cimetidine (Tagamet), clofazimine (Lamprene), anti-TNF-α agents, infliximab (Remicade, Trexall), etanercept (Enbrel), levamisole (Ergamisol), and dapsone. For individuals with a first episode, confirmation of the diagnosis is important to make sure that there are not other diseases mimicking an aphthous ulcer. For a person with recurrent aphthous ulcers it is best to work out a treatment plan with your health-care professional to minimize unneeded trips to the physician while also making sure that pain and suffering are minimized. Avoid anything that could cause trauma - even minor trauma - to the mouth, such as hard toothbrushes and rough foods. Stress reduction: For many individuals, stress is a reason for more recurrent attacks, and stress-management techniques may decrease the frequency of attacks. Avoid toothpastes that contain sodium lauryl sulfate if you tend to get canker sores. Do not talk while chewing. Have any irregular dental surfaces repaired. Hormonal factors can sometimes trigger an outbreak in women during the premenstrual phase, and oral contraceptives may be helpful. If the affected individual has a deficiency of iron, folic acid, or vitamin B12, make sure to take the appropriate supplements; however, in most cases, this will not produce any improvement in the recurrence of the ulcers. Most people are minimally inconvenienced by canker sores, because attacks usually are infrequent and last only a matter of one to two weeks. The more severe form, however, tends to last longer. As a person ages, canker sores should become less frequent and eventually no longer occur. Cold sores break out on the lips. Canker sores break out inside the mouth. Canker sores are not caused by the herpes virus. A cold sore starts as a blister and then ruptures. Abascal, K., and E. Yarnell. "Treatment for Recurrent Aphthous Ulcers." Alternative and Complementary Therapies 16.2 (2010): 100-106. Messadi, D., and F. Younai F. "Aphthous Ulcers." Dermatologic Therapy 23 (2010): 281-290. Scully, C. "Aphthous Ulceration." New England Journal of Medicine. 355 (2006): 165-172. What symptoms have you experienced with canker sores? What medical treatments have you found to be effective for canker sores? What things (disease flares, medications, other diseases, conditions, etc.) triggers or cause canker sores for you? What home remedies have you found helpful in treating canker sores?